Have you ever wondered what it would be like to find yourself strapped to a giant rocket that's about to go from zero to 17,500 miles per hour? Or to look back on Earth from outer space and see the surprisingly precise line between day and night? Or to stand in front of the Hubble Space Telescope, wondering if the emergency repair you're about to make will inadvertently ruin humankind's chance to unlock the universe's secrets? Mike Massimino has been there, and in Spaceman he puts you inside the suit, with all the zip and buoyancy of life in microgravity. Massimino's childhood space dreams were born the day Neil Armstrong set foot on the moon. Growing up in a working-class Long Island family, he catapulted himself to Columbia and then MIT, only to flunk his first doctoral exam and be rejected three times by NASA before making it through the final round of astronaut selection. 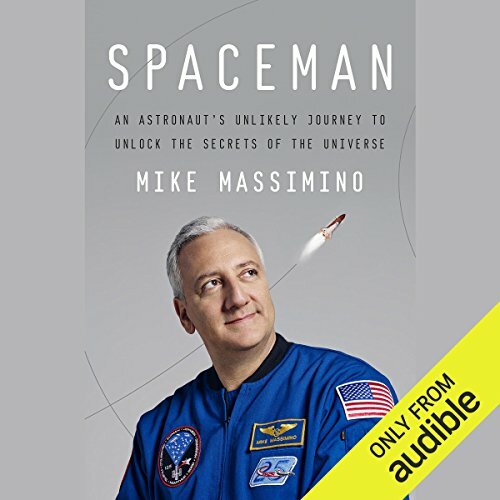 Taking us through the surreal wonder and beauty of his first spacewalk, the tragedy of losing friends in the Columbia shuttle accident, and the development of his enduring love for the Hubble Telescope - which he and his fellow astronauts were tasked with saving on his final mission - Massimino has written an ode to never giving up and the power of teamwork to make anything possible. Spaceman invites us into a rare, wonderful world where science meets the most thrilling adventure, revealing just what having "the right stuff" really means. ©2016 Michael J. Massimino (P)2016 Audible, Inc. I loved this book. I've read quite a few astronaut accounts and none have given me a visceral sense of what it feels like to take off in a rocket, until Spaceman. Mike Massimino has a way with words, and narrating it himself is what makes it come to life. It's brilliant. The other lasting memory I have from this book, which I listened to more than a month ago, is the view of earth from the Hubble. Again, he takes you there. First, he makes sure you realize how unique the view is, and that only a small handful of people have seen it. He contrasts the view from the moon, from which you can only see part of the earth, with the view from the Hubble, so high that you can see the entire sphere of earth. It was an ah ha moment for me. It wasn't until the Hubble launched that we earthlings saw pictures of the 'globe', the beautiful little round ball that is our planet. From there, Massimino brilliantly describes what it was like to see it firsthand. You are there, almost seeing it with him, forcing himself to look away so that he can perform his spacewalk work, as it was so mesmerizing it was almost impossible. Wow. This is also a great book for Canadians who will enjoy getting an understanding of how the Canada Arm really works, and what it makes possible. Being a Spaceman was the dream of many rope in my generation, only a few could achieve it and this is the story of one of them. Narration by the author was excellent, he had the ability to convey every emotion in the best way. The story is remarkable and inspiring, listening to it was like being there and understanding what it meant to him, highly recommended. Great story! I was completely amazed the entire time I was listening. Thanks for sharing. Normally nonfiction books don't keep me listening late into the night, repeatedly adding "just 15 more minutes" to the sleep timer for hours. This one did. Mike describes his path from being a boy on Long Island playing in a homemade astronaut costume through the series of choices, challenges, and lucky breaks that culminated in his two spacewalks to perform maintenance on the Hubble telescope. His story is by turns moving and thoughtful and funny and suspenseful. Mike did a fantastic job with the narration; his humor and humility shone through the whole time. I don't normally write reviews and fear I haven't done this book justice, but I'm pretty much going to be encouraging everyone I know to read or listen to it, so why not start here? this has to be one if not "THE" most amazing, inspiring book I've ever read in my life. half way through it I put it down and called my university to set up a start date to go back to school and finish my degree. it is so easy to find and excuse to just give up but that's all it is, just a whole bunch of excuses, hearing Mike talk about how an average person much like us "normal people" not geniuses with the perfect health or wealthy family can overcome every obstacle and full feel his dream makes you stop and rethink your self and say hey its time act, it's time stop "just making it by" it's time to get up and start pushing forward, this is the feeling I got when I read this book. hope to some day I get to meet him and thank him in person for giving me the push I needed, that ray of hope that I lost so many years ago, or to put it in his terms, that kindle that light my dreams once more. I was born and raised on Long Island not far from where "Mass" is from. I am a lifelong NASA fan, Amateur Astronomer and space exploration enthusiast. Listen to/read this book. Mass tells it like it is; like a real guy from Long Island. He really gives you an amazing perspective about just what it means to strive for and to become an Astronaut. As a child Massimino was fascinated and preoccupied with space exploration. He gathered information about his heroes, Buzz Aldrin, John Glenn and Neil Armstrong. He wanted to grow up and be an astronaut. Massimino graduated from Columbia and MIT with an engineering degree and then he went to work for NASA. Massimino tells in detail about his life as an astronaut and the various missions he was on. I was most interested in the work he did to correct the problem with the Hubble Telescope. He goes into detail about what life in space was like and all the problems he and other astronauts had to overcome. Massimino had obstacles he had to overcome to achieve his goal and how he went about overcoming them is inspiring. The book is well written in an affable, conversational style prose. It is great to read about someone achieving their childhood dream. I also found the fact he maintained an unwavering obsession with space all his life absolutely great. The book has humor and is easy to read. It leaves the reader with an upbeat feeling. This is a good book for a young person to read, who is trying to decide on a career choice. Now there is a choice of not only NASA but dozens of private corporations all working in space exploration. Mike Massimino did a good job narrating his own book. This book is Out of this World!! Would you listen to Spaceman again? Why? This book is captivating - especially if you love NASA's space program. Mike Massimino has a special talent and passion for bringing us along on his historic journeys - both on earth and in space. Mike's drive to overcome all hurdles to become one of America's most memorable astronauts. What about Mike Massimino’s performance did you like? Mike Massimino's patriotism and passion for following in the footsteps of some of America's greatest heroes is clearly articulated by this amazing storyteller. Taking passion and perseverance out of this world. I would give almost everything to meet and / or get an autographed picture and book from this great American astronaut. Truly--A Man With The Right Stuff! "Mass" as he was dubbed given his size, celebrates the 7-year old boy dreaming to the man he's become: open and optimistic about the future. "Spaceman" chronicles every hurdle, every opportunity taken along the way to becoming a top astronaut. From thinking he had the wrong major to battling qualifications about his eyesight, from struggling through a Shackleton-like endurance camp to the challenges of robotics, everything is covered. You want to know about the wonders of a spacewalk, about the glories of the Hubble telescope, here you go, all written in exciting prose and narrated by the man himself. And you feel like you're right there, in his shoes, experiencing it for yourself. Even the deathly silence after the Columbia disaster, the grief of the families and friends. Definitely worth the time, worth the price. You'll be flying in the science fiction space-monster, hurtling through space, viewing the Earth we live on far, far above. This is a wonderful biography that provides insight into Space travel and the people involved. Author as reader makes it even better. This book is terrific. It's emotional and allowed me to imagine what it would have been like to be an astronaut. What an incredible journey! Thank you for sharing your story. You are a true inspiration! Mike Massimino's story is one you really should not miss! It is the story of how a guy who could have settled for being just an 'Average Joe' decided from a very young age that he really wanted to be an astronaut. The Publisher's Summary gives an in depth description about what to expect. In short, this is the story of how you can reach your dreams if you stay focused and never lose faith. That is, you set a goal for yourself, start taking the right steps, are not deterred by setbacks and basically, do whatever it takes to achieve your goal. In other words, you've got to believe in yourself and not give up! Mike was lucky to have a great personality in that he loves people and is a real team player. His honesty is disarming and one can readily see why he was picked for the NASA astronaut program. His personality shone through every moment of his very excellent narration. Expect to learn so much from Mike--the requirements of the program, the camaraderie he craved and received, how the astronauts' families are not just an after-thought but are nurtured and taken care of, the Columbia disaster, the Hubble telescope, NASA politics, and so much more. I found every moment of this audiobook fascinating and enjoyable and am so glad I was convinced to get it by another listener's enthusiastic review. I only hope I can do the same for someone else. Books like this are to be treasured and recommended to others.